The snow is melting away, and I hope we won't get any more of it now... But in the wait of seeing real flowers popping up through the ground, here are some field daisies by Fabergé! They were made by workmaster Henrik Wigström in 1908. The heads of the four daisies are made of opaque white, pale pink and translucent green enamel. In the center of each flower sits a bronze-foiled rose-cut diamond. The stalks are made of green gold, and the leaves of nephrite. 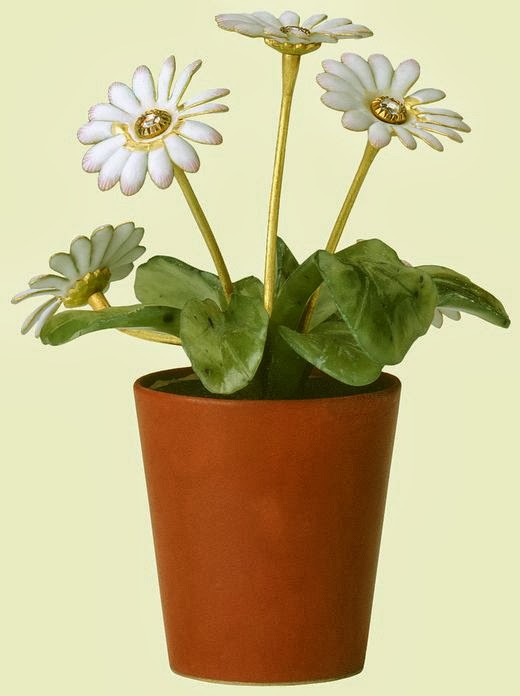 The plant sits in a silver enameled terracotta flower pot with simulated soil. It was acquired by Queen Alexandra, consort of King Edward VII, and can now be found in the Royal Collection.